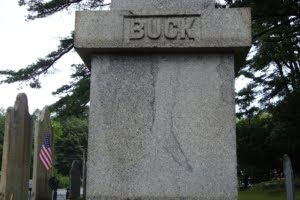 A visit to the coast of Maine would not be complete without viewing the haunted headstone of Colonel Buck on US Route 1 which is also Main Street in Bucksport. Growin’ up in Maine in the 1950’s included haunted lore besides my true stories. A visit to the coast of Maine would not be complete without viewing the haunted headstone of Colonel Buck on US Route 1 which is also Main Street in Bucksport, Maine. A historic plaque describes the legend of this cursed and haunted headstone. The outlined form on the photo of Buck’s grave as shown is said to be a witch’s leg! This monument was erected in memory of Colonel Jonathan Buck, founder of Bucksport, who died on March 18, 1795. The memorial, built of Blue Hill granite, was erected by his descendents nearly sixty years after his death. Sometime after it’s placement the outline of a leg appeared on the monument. Making their appearance as well were the stories which became legendary. The variations are many but common elements include Colonel Buck’s condemnation of a woman for witchcraft and ordering her death by burning for sorcery. As the sentence is being carried out, the woman curses the Colonel and concludes with “…so long shall my curse be upon thee and my sign upon thy tombstone.” As the flames consume her body, her leg falls away and rolls out of the fire. Her deformed son, rejected by the community, grabs the leg, further insults the Colonel, and flees into the wilderness. The curse is forgotten until sixty years later. The monument is erected; the leg appears. Attempts to remove the sign are futile. The facts surrounding the life of Colonel Buck are that he was an honorable, industrious man who founded this community and was a leader in its early development – building the first saw mill, the first grist mill, and the first boat. Notably, the “witch’s curse” was unheard of before the flaw in the marker appeared. There you have it. The haunted headstone may be viewed at the edge of Buck’s Cemetery on Main Street at the corner of Hinks Street in Bucksport, Maine. You may easily take photographs through the iron fence from outside the cemetery rather than risk taking a closer look.